Many of the flesh-eating scenes in the film were leftover hamburgers and meatballs from lunch…covered in chocolate syrup. So to pay homage to the “human flesh” the zombies feasted on throughout the film, I’ve concocted a rich and tangy BBQ sauce using Bosco syrup. October marked fifty years since George A. Romero unleashed Night of the Living Dead upon the world. Using second-hand clothing, a public cemetery, roasted meat, and Bosco chocolate syrup, Romero completely reinvented the concept of the zombie film. Fun fact: many of the flesh-eating scenes in the film were leftover hamburgers and meatballs from lunch…covered in chocolate syrup. 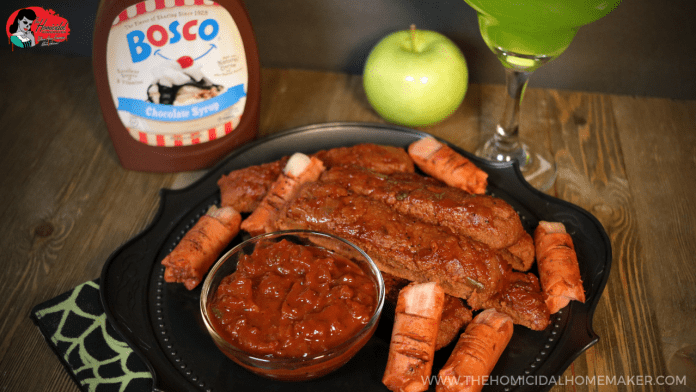 So to pay homage to the “human flesh” the zombies feasted on throughout the film (as well as Tom and Judy’s demise where their charred remains turn into a zombie BBQ gathering), I’ve concocted a rich and tangy BBQ sauce using Bosco syrup. Use it over your favorite grilled meats, or with the following recipe to make your own vegan-friendly charred “human remains”! I know that the thought of a CHOCOLATE SYRUP BBQ SAUCE totally sounds weird, but the sweetness from the sugar, and the chocolate adds a different depth of flavor to this otherwise tangy sauce. If you prefer a smoother sauce, go ahead and give it a whirl in a high-powered blender, food processor, or with an immersion blender. But I prefer to serve mine chunky – I feel that the chunks of vegetables really adds to the gore-iness of the recipe! 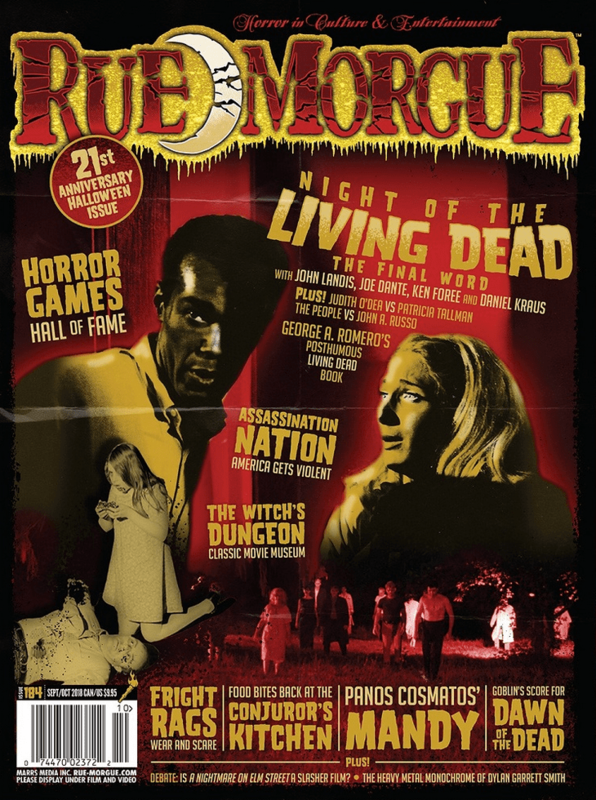 See this recipe in issue #184 (Sept/Oct 2018) of Rue Morgue Magazine! In a saucepan over medium-high heat, sauté onions and garlic in olive oil until tender. Stir in lemon juice, salt, pepper, and paprika. Simmer for 5 minutes. Reduce heat and stir in chili sauce, chocolate syrup, apple cider vinegar, and yellow mustard. Simmer over low heat for 15 minutes. Use on your favorite grilled meats, or as a dipping sauce. NOTE: This yields a very chunky sauce. If you prefer a smoother sauce for basting, simply give it a good whirl in a high-powered blender, food processor, or with an immersion blender. Preheat oven to 350° F. Line a small baking dish with parchment paper and and set aside. In a bowl, stir together the vital wheat gluten, nutritional yeast, paprika, onion & garlic powder, and pepper. In a separate bowl, whisk together the vegetable broth, peanut butter or tahini, liquid smoke, and soy sauce. Pour mixture into the dry ingredients, stirring until well-incorporated and formed into a soft dough. Knead gently for two minutes. Transfer the dough mixture to the lined baking dish and shape into desired body parts. For “ribs” (as shown here), spread the mixture evenly across the entire pan, and use a knife to score the dough into 1-inch slices. Bake for 25 minutes. Brush both sides of the “ribs” with the Bosco “Blood” BBQ Sauce, and return to oven for an additional 10 minutes, or, cook on a grill for 5-6 minutes until deeply browned. Serve with additional sauce on the side for dipping. Did you make this Bosco “Blood” BBQ Sauce or “Charred Remains” recipe inspired by “Night of the Living Dead”? Be sure to snap a photo and hashtag it #homicidalhomemaker and #ruemorguemag for a chance to be featured! Previous articleThe Nightmare Queen: a Vegan Take on Burger King’s Nightmare King! Next articleWarm Up With Hot Buttered REDRUM Inspired by “The Shining”!